The impact of coalition operations in Afghanistan is often bogged down in statistics and political manoeuvring. 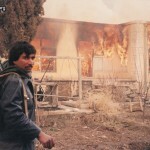 But these photos of a devastated village in the Arghandad River Valley show the horror of war in stark reality. 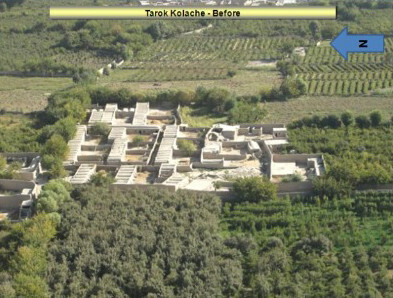 Tarok Kolache, a small settlement in Kandahar, has been completely erased from the map after an offensive by the U.S. army. 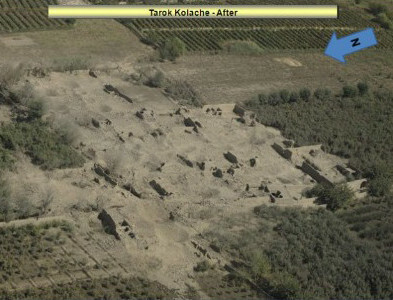 Before and aftermath: The picture above shows the village of Tarok Kolache in the Arghandab River Valley. The picture below is the same location following allied air strikes, which completely obliterated the village. Taliban militants had taken control of the village and battered the coalition task force with homemade bombs and improvised explosive devices. And after two attempts at clearing the village led to casualties on both sides, Lieutenant Colonel David Flynn, commander of the Combined Joint Task Force 1-320th gave the order to pulverise the village. His men were ‘terrified to go back into the pomegranate orchards to continue clearing [the area]; it seemed like certain death’, writes West Point graduate Paula Broadwell on the Foreign Policy blog. The destruction only escalated, however, with ’49,200lbs of ordnance’ dropped on the village via air strikes and ground-launched rockets, which saw it swiftly blown off the face of the earth. The results of the battery were adjudged to have left ‘NO CIVCAS’ - no civilians killed. But with Tarok Kolache bombarded with close to 25 tons of explosives, assuming some collateral damage does not seem unjustified. Outside analysts have not been able to assess the impact of the bombing on civilians due to security concerns. However, it has been agreed that 'extreme' operations such as the destruction of an entire village are likely to have a negative impact on attempts to improve coalition-Afghan relations. Erica Gaston, an Open Society Institute researcher based in Afghanistan, told Wired the erasure of Tarok Kolache was exactly the type of behaviour that would deal a body blow to Afghan acceptance of the presence of the International Security Assistance Force. 'But for this, I think [NATO] would have started to get some credit for improved conduct,' Ms Gaston wrote in an email. 'Some Kandahar elders (and I stress ’some,’ not ‘all’ or even ‘most’) who had initially opposed the Kandahar operations were in the last few months expressing more appreciation for ISAF conduct during these operations, saying they had driven out the Taliban and shown restraint in not harming civilians. However, astonishing pictures like those above could become a regular feature of coalition operations in Afghanistan, with ISAF commander General David Petraeus approving both construction and destruction projects. According to Ms Broadwell's post on Foreign Policy, General Petraeus has approved $1million worth of reconstruction projects but also told his commanders in the south of Afghanistan to 'take a similar approach to what 1-320th was doing on a grander scale as it applies to the districts north of Arghandab'. Miss Broadwell, who has served as a major in the U.S. Army, was educated at Harvard University before completing a PhD at London University's War Studies Department. Her Linkedin profile page states that she also graduated from the U.S. military academy West Point, and has worked for the FBI's Joint Terrorism Task Force.